The SPARC newsletter (ISSN 1245-4680) appears every 6 months. It contains news on current SPARC-related research activities, meetings, workshops, and conferences. Contributions are made by the SPARC community. The SPARC newsletter appears every 6 months. It contains news on current SPARC-related research activities, meetings, workshops, and conferences. Contributions are made by the SPARC community. The SPARC eNews is an html-based concise newsletter issued in the months of January, March, May, July, September and November. It informs the community on updates to the SPARC website, reminds it of upcoming deadlines and spreads the word on arising opportunities. Your contact information will be used to send the SPARC eNews bulletins, SPARC Updates, and SPARC Event Information via email. SPARC will keep all personal data strictly confidential. We will not share your personal information with or sell it to third-party marketers or use it for any purposes other than those listed above. Send an email to the SPARC Office at gro.e1555870701tamil1555870701c-cra1555870701ps@ec1555870701iffo1555870701. Authors are invited to contact the SPARC Office for newsletter contributions. These include science articles and workshop reports. Submission deadline for the January issue is 15 November, and for the July issue it is 15 May. Find Guidelines for authors (June 2016). 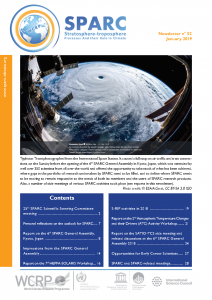 SPARC, 2013: SPARC Newsletter No. 40, January 2013, 68 pp., available at http://www.sparc-climate.org/publications/newsletter. If you wish to order a specific hardcopy issue, contact the SPARC Office. Please remember to send us a quick email with your feedback to gro.e1555870701tamil1555870701c-cra1555870701ps@ec1555870701iffo 1555870701. Thanks!